Reis E-320 - Technology Unlimited, Inc.Technology Unlimited, Inc. 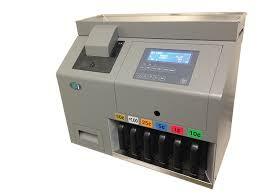 The model E-320 is a rail coin sorter that can count and sort up to eight coin denominations. It utilizes the very latest (foreign) coin detection system Coinsure Adaptive®. The sorting is done corresponding to the coin diameter. It has a large inspection tray to allow the coins to be cleaned before entry into the hopper. Output is to a single drawer or bag or coin roll tube (optional) per denomination. Operator ID can also be registered on any printout or data transfer.